Congress has passed a Joint Resolution No. 19 which extends the life of CARP for another six months. The extension excluded the compulsory mode of acquisition which is the “the life and soul of carp” . Prospero Nograles said the resolution saved the life of CARP which ends this month. It saved (kuno) but paralyzed it. There are still 1.3 million hectares of land waiting to be distributed, more than 60% of these or 640,000 hectares are under the compulsory acquisition mode. Joint Resolution No. 19 is obviously protecting these 640, 000 hectares of land. Congress is dominated by landlords, this bill is “their bill” and not for the people which they are supposed to represent. Gloria Macapagal-Arroyo is really leading by example not only in corruption but also in pushing for Agrarian Reform. The Arroyo family is reported to own roughly 500 hectares of sugar lands in Negros Occidental, including the 150-ha Hacienda Bacan, which has evaded CARP coverage. The extension is supposed to give congress more time to come-up with an “acceptable legislation”, acceptable to whom? I just hope that they will not extend and extend CARP until it is dismantled and lifeless. 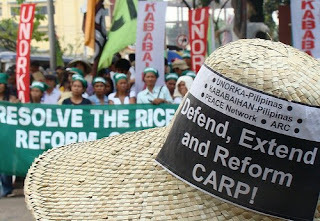 Agrarian reform advocates are already fearful of a slow kill of the program. There are several bills in the House of Representatives which are waiting for more debates and discussion, bills which have been put in the background in their efforts to extend the term of their boss. In the next post, I will try to write about the four options among the many bills in Congress on CARP Extension.